Is this house at 3902 Keyes a good investment? At $899 a naive investor in Tucson might think so. If you examine the Flint real estate market, you might be surprised by what you find. As of today, there are more than 1,200 homes for sale in Flint, along with dozens of commercial properties. With the well-documented socio-economic problems of the Vehicle City, the question is who would ever buy one of them? Apparently, many will be snapped up by out-of-town investors. That’s right, out-of-town investors are buying Flint real estate. I know what you might be thinking. Who are these lunatics? We have to find them and get them the help they need, right? But after interviewing two local real estate agents, who asked not to be named, I’ve discovered it’s not as crazy an idea as it might seem. Okay, it is crazy, but with a lot of luck and a taste for adventure, it’s possible to make money at it. Or at least that’s what the out-of-towners think. Obviously, the rock-bottom price of property in Flint gets the attention of investors. But another surprising factor makes it irresistible to many of them — rental prices in Flint are reasonably high. Take a look at Craigslist and you’ll find two-bedroom rentals going from $300 to $700 a month. And with the spate of foreclosures, the demand for rentals is climbing, which might bump up prices even more, despite the city’s steadily declining population,” according to one real estate agent. Let’s use an extremely optimistic hypothetical example to illustrate how this might work. 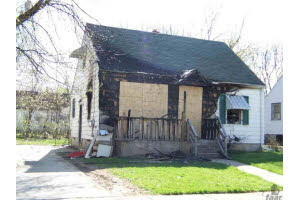 An investor buys a house in Flint for $2,000 and puts $3,000 into fixing it up for rental. He rents it for $500 a month. That’s $6,000 in pre-tax revenue after one year, enough to cover the purchase and repair cost. At the end of the second year, he’s made $6,000 in pre-tax profit. Now imagine if the investor owned 20 houses. Suddenly, he’s the Donald Trump of Flint — hopefully with better hair — pulling down $120,000 in rental income each year. And don’t forget he gets to depreciate the value of the houses each year, which cuts down on taxes. Now how would this scenario be even rosier for the investor? Well, if he was willing to be a slumlord and make almost no improvements to the property, he wouldn’t have to worry about repair costs too much. In fact, he could let the house “depreciate” over the years to the point that it’s uninhabitable and needs to be torn down. (This also eliminates the possibility of capital gains taxes if the property ever appreciated in value and he sold it.) He milks the house for all it’s worth and he’s left paying taxes on a vacant lot. And that’s often less than $20/year. The problem is that even scrupulous, well-intentioned investors often don’t realize what it means to own property in Flint. Many times they’ve never even been to the city or seen the property. They’re not aware that renters might have drug problems. Or guns. Or both. Or, they may be struggling to survive and simply can’t pay rent sometimes. The investor just sees the cost of the house and the typical rents and gets excited. Plus, if the deal goes bad, a well-off investor doesn’t really care if he loses $10,000 on a house or two. It’s a write-off. That’s why, according to a local realtor, investors sometimes buy several houses at once, or even entire blocks, sight unseen. “David Hurley, a lifelong east Flint resident, mows his own lawn and the lawns of about a dozen properties he doesn't own in his neighborhood,” Lawlor writes. “He mows lawns and plants gardens on property owned by banks, out-of-state owners and the Genesee County Land Bank. “Nobody pays him to do it. “He does it because he said if he didn't the neighborhood would be overtaken by weeds. “He looks around his neighborhood and sees increasing numbers of rental homes, weed-strewn empty lots and shells of houses with doors broken off, the copper stripped and the siding stolen. “The neighborhood is being hollowed out, house by house. "’People from out-of-state are buying properties for $5,000, $7,000, for investment reasons. They've never even seen them,’ said Hurley, while driving through the east side. Click here for audio of Joe Lawlor interviewing David Hurley about his neighborhood. wow... so "destroyed by neglect" homes are investment incentives because they can devalue... who knew? that's really depressing. I'm wondering if any of these out-of-towners (which, remember, are only one of numerous OOT options, including bank ownership) are actually expats. Personally, I am tempted by the $900 home in Carriage Town and by one on Forest Hill Ave listed for $4,000. I'm not a real estate investor, I'm pro-local and -civic action, and I'm very tempted. "estimated payment $4 a month"
Why stop with just one or two properties, buy the whole block! Realtor.com is a trip. You can get a mansion on Crooked Lane for $175,000 and the Burroughs ESTATE for like $600,000. Flint is ripe for a competitive reality show... maybe "The Slumlord Of Home Avenue"
I can see how non-Flintoids get drawn into this real estate fantasy. When I talk about Flint property values with my San Francisco friends, the numbers sound too good to be true. Keep in mind that these are people paying $1,400/month rent on 500sq ft studio apartments. Or $600 for a tiny room in a group house with six other people. Or $3,000/month mortgages. I'm sure people figure the prices are so low that it will override the drawbacks of trying to rent property in Flint. Of course, many Flint investors are just shameless opportunists who don't give a damn what happens to Flint. Realtor.com is fun. I wonder why many of the houses don't have pictures and virtual tours though. I also love looking at Piper Realty (http://www.piperrealtycompany.com/mls/listings.php). They get many of the sales of the mansions off Miller Road. They do have virtual tours and pictures. Great surfing entertainment.